My man is more into red meat than red roses and has zero interest in the sort of sweet treats that fill magazine pages in the run up to February 14. 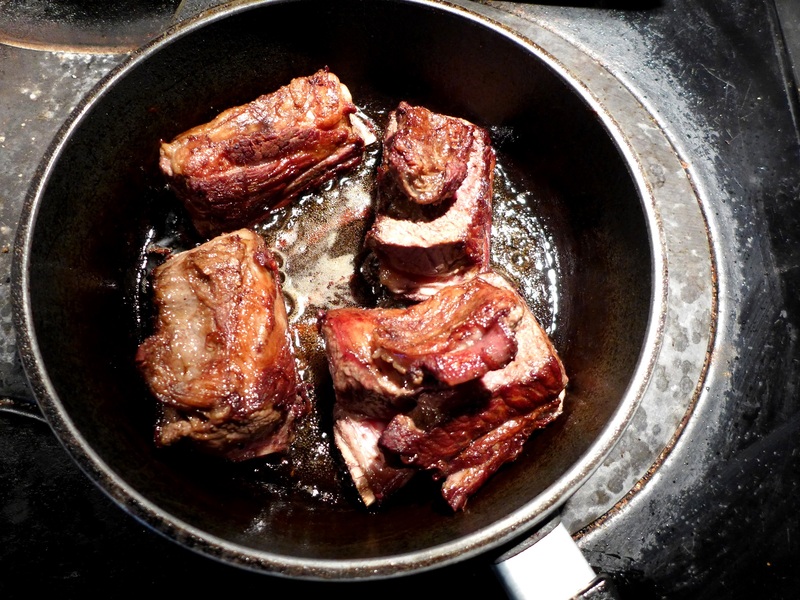 So if your significant other is more Desperate Dan than the Cadbury’s Milk Tray Man, you might like to indulge him/her with this recipe for beef short ribs. The ribs I got were enormous, even by Dan’s standards, so I allocated one per person and there was a gracious plenty. 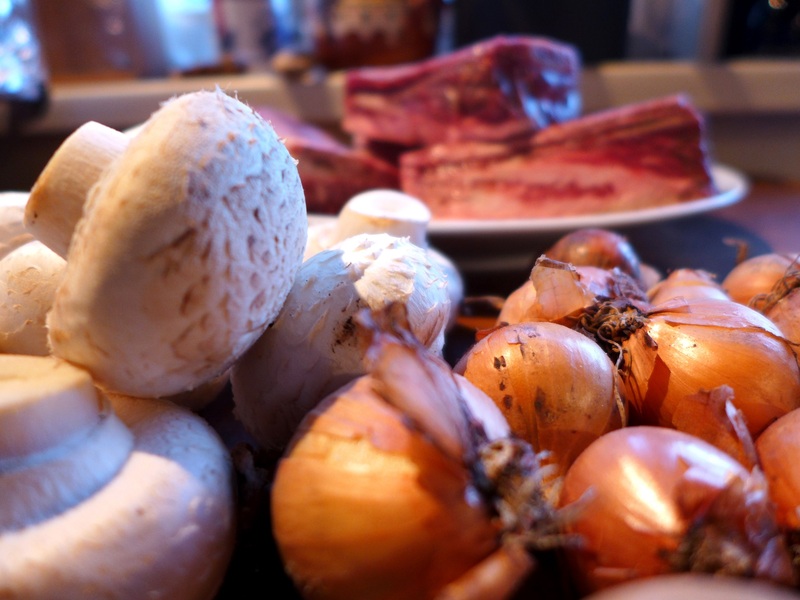 They’re incredibly good value and given the slow-cooked boeuf bourguignon treatment, they fall off the bone and melt in your mouth. The recipe is best begun a day ahead. Pre-heat the oven to 170C/325F/Gas Mark 3. Heat some oil in a cast iron casserole and brown the ribs on all sides. Don’t rush this, you want a good, dark colour. Remove from the pan and set aside. Using the fat in the pan, brown the onions all over. Remove and set aside. Now do the same with the mushrooms, but keep them separate as they get put into the stew later in the process. Then fry the bacon in the same pan until it’s given up most of its fat. Remove and set aside with the onions. Pour off the fat and de-glaze the pan with the red wine, letting it sizzle up, then put the beef, onions and bacon back into the pan. Add the stock, garlic and bouquet garni and check the seasoning. 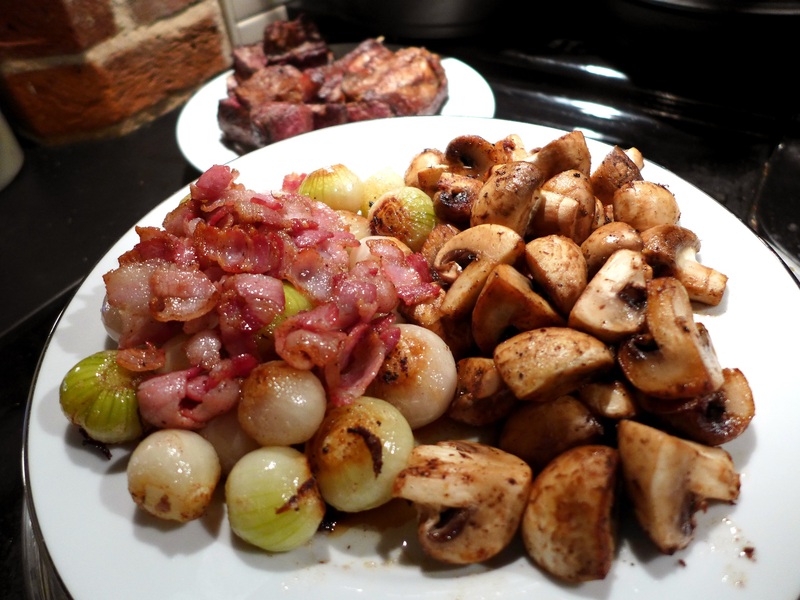 Use plenty of ground black pepper but don’t go too mad with the salt because of the bacon. Give it a stir, making sure the ribs are more or less submerged. Cover and place in the oven and cook for two to two and a half hours then carefully remove from the oven and skim off any fat, or if you’re eating it the next day, chill it and remove the fat. 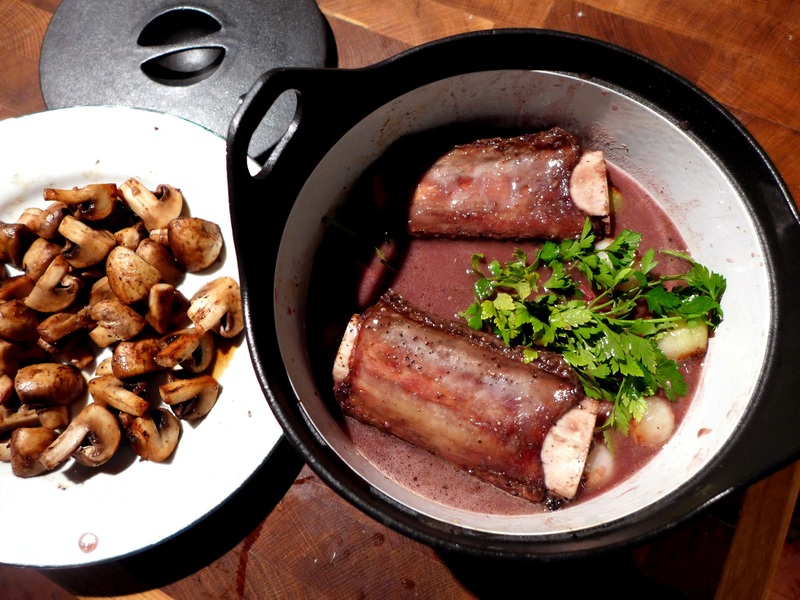 Remove the ribs and keep warm while you thicken the sauce, to taste, with beurre manié or cornflour (mixed with a little water). 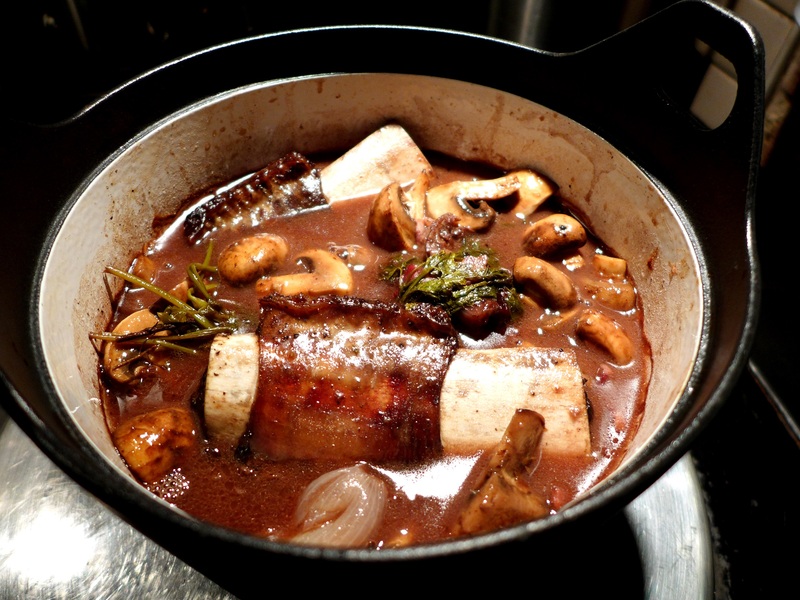 Stir in the mushrooms, or add them just before you reheat the casserole next day. Return to the oven for a further half hour or so, until the meat is falling off the bones and piping hot. Remove the bouquet garni and check the sauce is to your liking, adding more seasoning if necessary. Try the ribs with a buttery but stiff mash and the veg of your choice and with plenty of the gravy poured over. 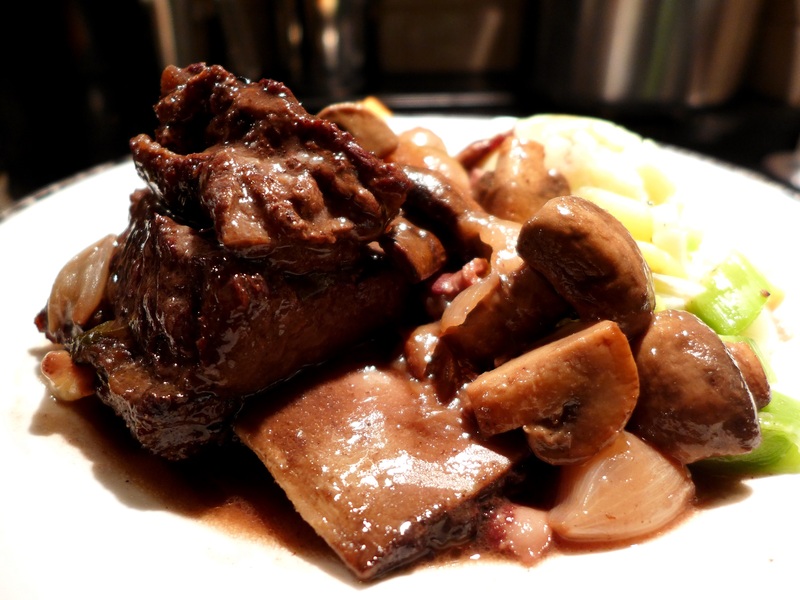 This entry was posted in Beef, Mains and tagged beef short ribs cooked with red wine and mushrooms, Burgundian beef short ribs, manly cooking for Valentine's Day, Valentine's Day recipes by Linda Duffin. Bookmark the permalink. I too love short ribs but my Dan wouldn’t touch them. However, he IS having the strawberry pancakes tomorrow for brunch and I know he’s going to love them. Perfection!!! Valentine’s Day? What’s that? Oh, these look amazing! I love this recipe, and will make these for myself, with or without a man for company! Thanks, Linda! Oh, it’s just a day. And those ribs would be great any day! Short ribs are such luscious meat. This sounds like a great way to prepare them. Thanks, S.A. Mammoths a speciality. Bring your own club! 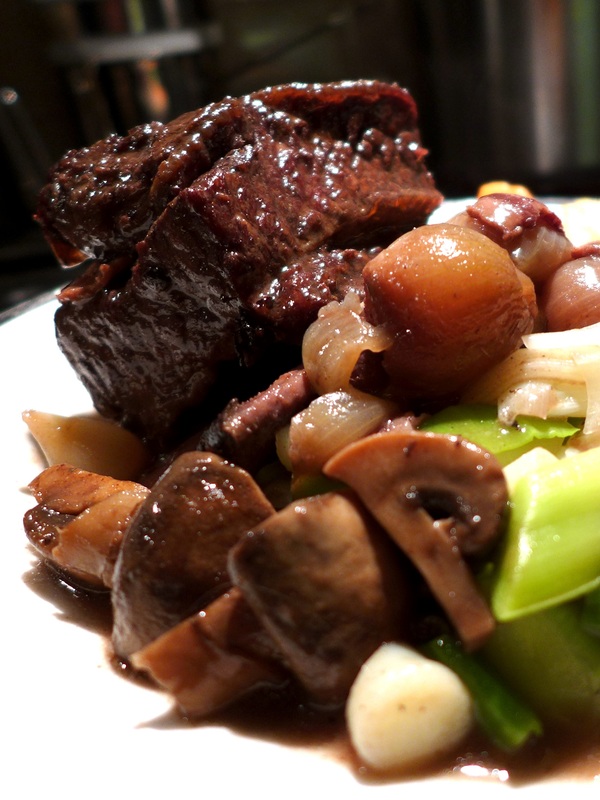 I really like your idea of using beef short ribs in this classic recipe. Your photos certainly make it look enticing.